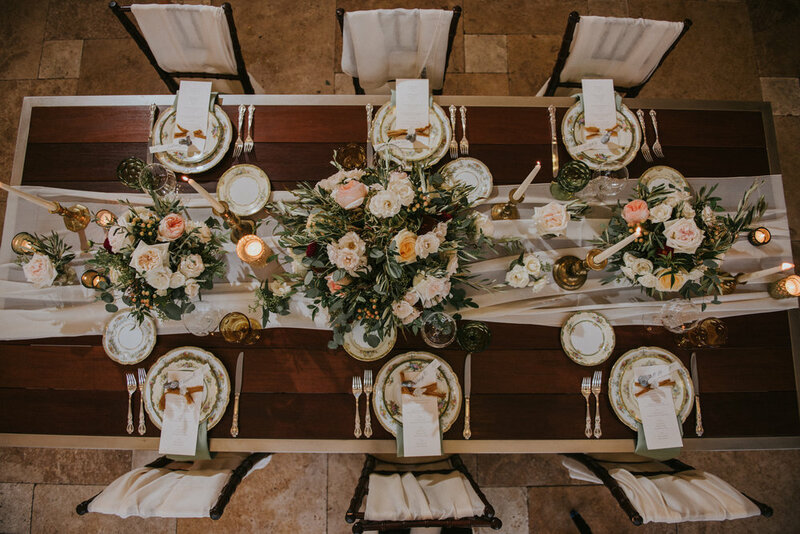 I am thrilled to have been apart of this gorgeous, inspired shoot !Designed by the talented and kind Lillian Rose Events, the tuscan elements combined with charm and elegant details of Galleria Marchetti created for a romantic, old world feeling wedding here in the Midwest! All photos by Jasko Omerovic Photography. For all vendor involved check the list below! Inspired by the romantic fields and wineries of Italy, I chose to work with earth tones and simplistic elements. A custom monogram surrounded by olives adorned the main invitation (swoon!). The olives leaves are carried though out the rest of the wedding paper goods from the details card all the way to the wax seal bringing texture the the table menus. My favorite two elements from the invitation suite quickly became the Italian tile inspired envelope liner and the lush, custom painted country side RSVP postcard. Both elements bring in more color to an other wise soft and romantic feeling invitation. Each paper element, though slightly varied from one another, are all connected through the calligraphy. I used my Lily style to bring a romantic but modern movement to each element. 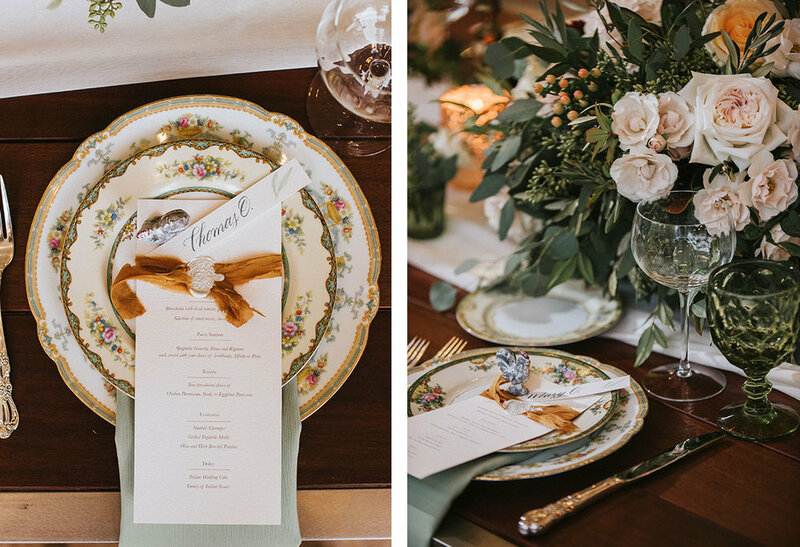 Choosing a soft grey ink allowed each paper good to feel rustic and compliment the gorgeous tones of the vintage dishes, beautiful table linens and gorgeous muted toned florals. When I heard about the Big Fake Wedding, I immediately thought about when I was a bride planning for my own big day. Being younger in age as a newly engaged bride-to-be, I hadn't attended many weddings with the mindset of what I liked about them and if I would repeat anything for my own day. The concept of the Big Fake Wedding is so simple and smart. They come to a city, gathering talented local vendors and “create an experiential opportunity for wedding vendors to showcase their products and services to shopping brides and grooms just as they would at a real wedding.” You get to see the wedding in the form of a vow renewal ceremony and the reception complete with drinks, DJ and dancing. The best part s if you like something you see, taste or hear you can talk to the vendors who created it right then and there! How cool is that? The venue was the beautiful Zhou B Art Center owned and founded by two Chinese brothers, both incredible artist who rent out the space for art exhibits and events. This industrial and chic venue was full of charm and some seriously beautiful art. My role in this big day was one of two invitation designers. With such a rich color scheme and moodboard full of pattern and texture to work from, I knew that I wanted to do something more elevated than a standard invite to incorporate these elements. After deciding on this beautiful paper cut folder in a rich gold to house the invitation suite, I wanted to incorporate each color in a unique way on the rest of the accenting pieces. Blending the free strokes of the watercolor with the formality of the calligraphy created the perfect mixture of classic and modern that would be represented in both the venue and the elements of the wedding day overall. I loved how this suite represented the theme in a chic way! The day flowed like a real wedding, complete with photos of the “bridal” party, ceremony and reception. The bride and groom who modeled for the day performed a vow renewal during the ceremony portion including their pastor, real friends and family in their “bridal” party. It was a beautiful ceremony complete with string quartet playing a custom arrangement as the bridal party walked down the aisle and an incredible copper arch with lush florals serving as the backdrop for the bride and groom’s ceremony. The reception was full and fun with fantastic appetizers, desserts and specialty mixed drinks. The bride even performed a special choreographed dance mid reception! Thank you again to the team at The Big Fake Wedding for having me, it was such a fun party to be apart of and incredible to meet so many wonderful couples!